nenjE – Oh the mind! thALgaL – divine feet (of theirs). He is divining to his mind to praise the divine feet of those who always love the thirukkarththikai month, thirukkarththikai star day for it being the day thirumangai AzhvAr came here for divining six dhivya prabandhams which are the six parts of the four vEdhas. mARan paNiththa thamizh maRaikku – unlike the samskrutha vEdham that is following itself as self-existent, the greatness of thiruvAimozhi is that it incarnated from nammAzhvAr. Like saying ‘vEdha:prAchEthasAdhAseeth [rAmAyaNam dhyAna slOkam – 16]’ (vEdham (rAmAyaNam) was created by vAlmIki), by saying ‘thamizh maRai’, it implies vEdham made in thamizh. 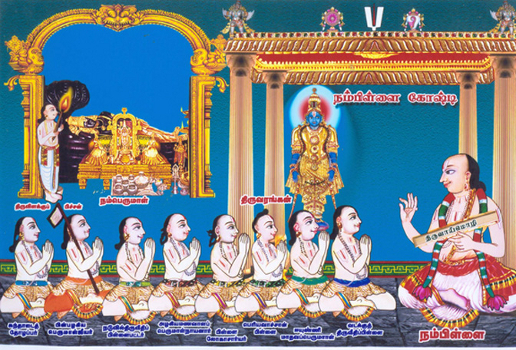 mangaiyar kOn ARangam kURa avadhariththa – So, for these prabandhams of nammAzhvAr which are equivalent to four vEdhas, thirumangai AzhvAr incarnated to provide the six parts related to vEdhas, in the form of six prabandhams. For the prabandhams thiruviruththam etc., of nammAzhvAr, the six prabandhams periya thirumozhi etc., of thirumagai AzhvAr represent its six parts; these can be said as thamizh parts for the thamizh vEdham. This is very well established in AchArya hrudhayam. vIRudaiya kArththikaiyil kArththikai nAL – In this way the incarnation of this AzhvAr who knows the true meanings of vEdhas and its parts (angams) is the reason for kArththikai month’s kArththikai day being glorious compared to other non-special days. 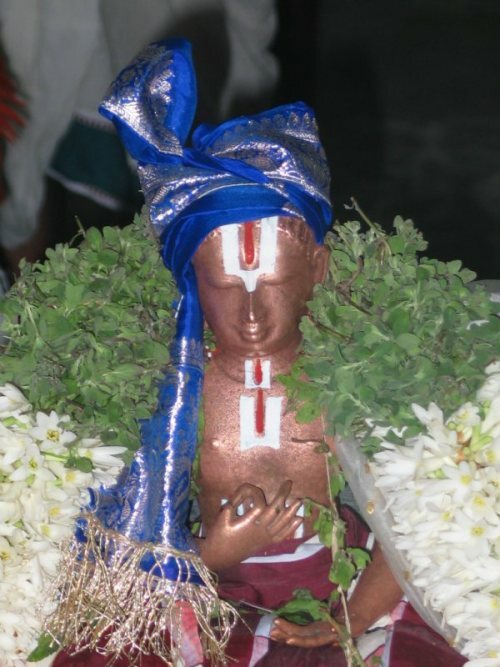 He is famously referred in the phrase ‘parAnkusa parakAlA yathivarAdhigaL’ (“nammAzhvAr and thirumangai AzhvAr, emperumAnAr and other Azhvar AchAryas”). Moreover, ‘thAn ugandha UrellAm than thAL pAdi [thirunedunthAntakam – 6]’ (praising the divine feet of emperumAn in all the dhivya dhEsams where He is present out of his love) – this greatness of praising in all dhivya dhEsams is applicable to this AzhvAr (as he went in person to so many dhivya dhEsams to do mangaLAsAsanam). kArththikaiyil kArththikai nAL inRu enRu kAdhalippAr – They (certain devotees) would think, among these insignificant days, there is this wonderful day that is available for us! For them this is also a ‘madhi niRaindha nannAL [thiruppAvai – 1] (Oh what a day! We got this wonderful day to meet krishNan! )., and would always be thinking about its greatness, and will live with increasing love for it. They are those like ‘kuRaiyal pirAn adik keezh viLLAdha anban irAmAnusan [rAmAnusa nURRanthAdhi – 2] (emperumAnAr who is ever having the devotion toward the divine feet of thirumangai AzhvAr). vAyththa malarth thALgaL nenjE vAzhththu – Oh mind! 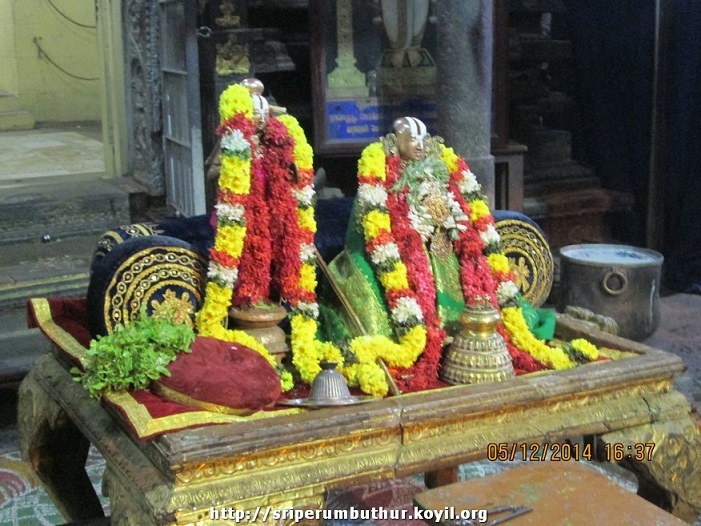 Since they (such devotees) are our lords, do mangaLAsAsanam that the existing devotion should continue forever, without straying – devotion towards their divine feet that is infinitely beautiful and is as per their svarUpam (nature) – is what you need to pray and praise, to keep to your nature (svarUpam) (of subservience). That should be similar to what is said in ‘pOndhadhu en nenju [rAmAnusa nURRanthAdhi – 100] (~ the golden bee that is my mind, flew into the divine feet of emperumAnAr). It is to be said – ‘inbuRum thoNdar sevvadi Eththi vAzhum en nenjamE [perumAL thirumozhi 2-4]’ (~my mind would live praising the beautiful feet of the devotees). malarth thALgaL – divine feet that are like flowers. By this, our nature is to serve and do good to those who are subservient to AchAryan. It was talked about with joy by noble and elderly srIvaishNavas, that he who is having the divine name of thiruk kali kanRi dhAsar, who is well-versed in the beautiful thamizh, and who preaches the meanings of all of the four thousdand dhivya prabandhams, that is lOkAcharyar, which is nampiLLai, and his divine lineage/family would celebrate with great love the divine incarnation day of thirumangai AzhvAr. 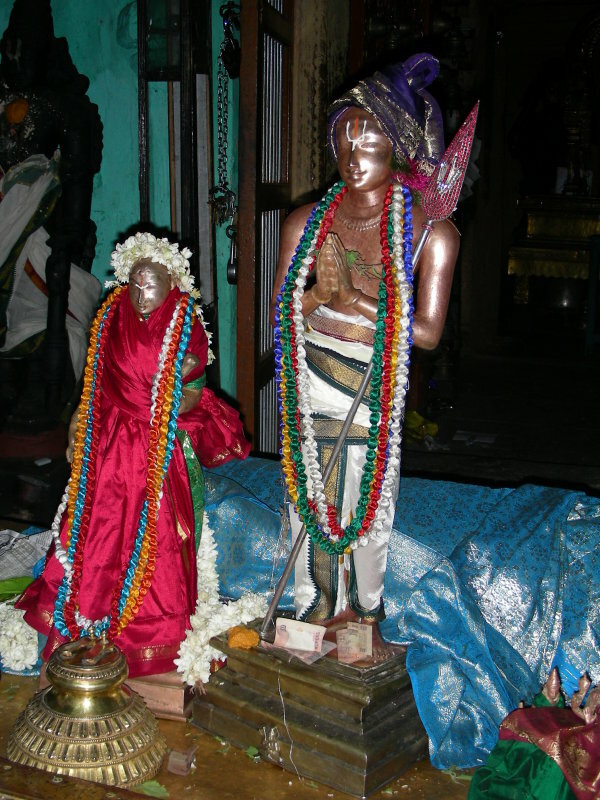 nampiLLai celebrates that day due to his love towards AzhvAr’s divine feet; his lineage/family celebrates the day due to their love for nampiLLai whose divine incarnation day is that same day too. This entry was posted in Other, upadhESa raththina mAlai and tagged 74, annan, azhvar, erumbi, erumbiappa, kaarthigai, kaarthikai, kaliyan, karthigai, karthikai, kovil, mamunigal, manavala, nampillai, pasurams, rathina, rathinamalai, raththina, raththinamalai, thirumnagai, upadesa, upadhesa on December 11, 2015 by raghuram.